Following successful tests in the early 1920s, reflection seismic technology was first used to find oil. The Petroleum Corporation drilled a well into the Viola limestone formation near Seminole, Oklahoma. It was the world’s first oil discovery in a geological structure that had been identified by reflection survey. Others soon followed as the technology revealed dozens of mid-continent oilfields. Conducted by Amerada Petroleum subsidiary Geophysical Research, the new exploration method resulted from experiments by an academic team led by Professor John C. Karcher of the University of Oklahoma. Reflection seismography – seismic surveying – applied techniques from weapons research. During World War I, Allied scientists developed portable equipment that used seismic reflections to locate sources of enemy artillery fire. Learn more in Exploring Seismic Waves. The Oklahoma City oilfield would bring stability to the economy of Oklahoma during the Great Depression. Photo courtesy Library of Congress. Henry Foster’s Indian Territory Illuminating Oil Company and Foster Petroleum Corporation completed the Oklahoma City No. 1 well, discovery well for the Oklahoma City oilfield. Oil exploration companies had searched for decades before this successful well just south of the city limits. The 6,335-foot-deep wildcat well produced 110,000 barrels of oil in its first 27 days, causing a rush of development that extended the field northward toward the capitol building. Drilling reached the city limits in May 1930, prompting the city council to pass ordinances limiting drilling to the southeast part of the city and allowing only one well per city block. By 1932, with about 870 producing wells completed, the Oklahoma City oilfield’s production peaked at 67 million barrels. “From such a beginning the sprawling Oklahoma City oil and natural gas field will become one of world’s major oil-producing areas,” notes a state historical marker. The field’s production ranked eighth in the nation for the next 40 years. 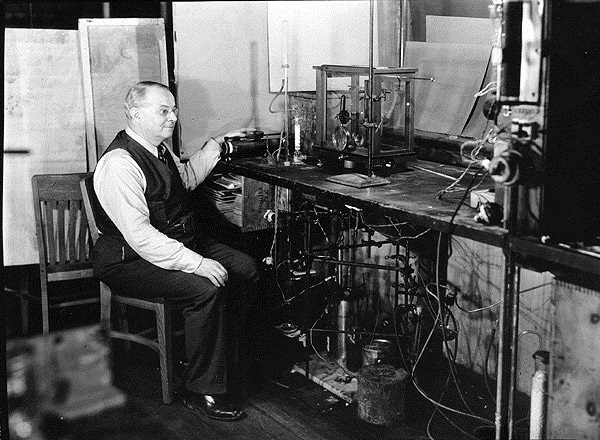 Professor Hamilton Cady in 1905 discovered helium could be extracted from natural gas from a well in Dexter, Kansas. Photo courtesy American Chemical Society. The importance of natural gas for producing helium was revealed when two University of Kansas professors, Hamilton Cady and David McFarland, discovered significant amounts of helium in natural gas from a well in Dexter, Kansas. Helium was rare and considered a national strategic resource at the time. Although the Dexter well produced “The Gas That Wouldn’t Burn,” it led to a scientific advancement that lighted the way to a multi-million dollar industry, according to the American Chemical Society, which designated the discovery of helium in natural gas a national historic chemical landmark in 2000. Improving upon the success of Cameron Iron Works’ 1922 mechanically operated ram-type blowout preventer (BOP), James S. Abercrombie patented a “Fluid Pressure Operated Blow Out Preventer” designed to be “operated instantaneously to prevent a blowout when an emergency arises.” After the success of the first ram-type BOP, the company’s machine shop in Humble, Texas, manufactured the latest rapidly reacting device in time for discoveries in the Oklahoma City oilfield. Many deeper, highly pressurized wells would require the new technology. Leaded gas helped engines, but harmed people. American motorists would soon be saying, “Fill ‘er up with Ethyl” after two General Motors scientists discovered a gasoline additive that greatly improved engine performance. In early engines, severe “knocking” resulted from the out-of-sequence detonations in the cylinders. GM researchers Thomas Midgely Jr. and Charles Kettering discovered the antiknock properties of tetraethyl lead after years of examining the properties of knock suppressors such as bromine and iodine. When they used tetraethyl lead (diluted to a ratio of one part per thousand) in a one-cylinder engine, the knocking abruptly disappeared. GM’s new leaded compound went on sale on February 2, 1923, at the Refiners Oil Company service station in Dayton, Ohio. Although the powerful additive proved vital during World War II, concern about tetraethyl lead’s serious health dangers continued to grow. This resulted in its phase-out for use in cars beginning in 1976 (it is still used in modern aviation fuels). Learn more in Ethyl “Anti-Knock” Gas. Another Oklahoma drilling boom began in the Seminole area following discovery of a giant oilfield. The Amerada Petroleum Company well uncovered the Bethel field and a new, highly prolific producing zone, the Wilcox sand. In October 1923, Joe Cromwell also had found a Seminole area oilfield with a well that produced more than 300 barrels of oil a day from about 3,500 feet deep. In March 1926, yet another discovery well opened the Earlsboro field, which was followed a few days days later by a well producing an astounding 1,100 barrels of oil a day from the Seminole City field. Learn more in Seminole Oil Boom.